When the mayor and the prime minister, launched the construction of the City Rail Link (CRL) before a euphoric crowd and performing dancers on that gorgeous morning in June, one would have assumed that this historic moment heralded a bright new era for rail in Auckland. But if so one would have assumed wrongly; for it soon became clear that the government, reluctantly log-rolled by Auckland public opinion into supporting the CRL, is determined that the CRL will be the last major project in Auckland’s 20-year rail renaissance. This became all-too-clear a couple of week’s later when the board of the NZ Transport Agency (NZTA) in Wellington voted to support a raft of resolutions that specifically excluded route protection and ‘any further option development’ of a rail connection to Auckland International Airport. A couple of weeks later the board of Auckland Transport (AT), marching in lock-step followed suit. Deliberately excluding route protection for future rail to the airport is one of the most irresponsible planning decisions I have witnessed during my time in Auckland local government. Auckland International Airport is of critical economic importance to Auckland and New Zealand. With passenger movements currently 17 million per year and set to double in the next 10 years, the airport company (AIAL) realises that rail rapid transit will be vital to keep its traffic arteries open and has sought AT’s technical advice. In September 2011 a multi-agency study that came to be called SMART, including AT, Auckland Council, NZTA, KiwiRail and AIAL, with consultants GHD, after examining the widest selection of modes, light rail, busway, heavy rail, (electric trains) decided on heavy rail from Onehunga (10km from the airport) to the airport and on to Puhinui (6.8km) on the main trunk line as the ‘most economically efficient’ long-term rapid transit solution – providing a single-seat journey to downtown Auckland and ultimately to Hamilton. 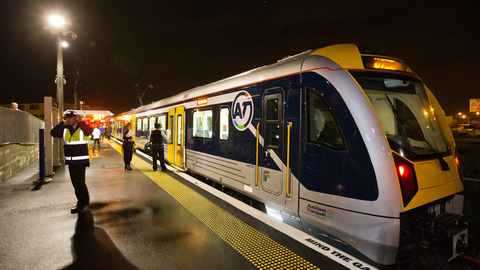 In 2012, rail to Auckland airport after much public consultation became a formal commitment in the Auckland Plan: route protect a dedicated rail connection in the first decade (2011-2020);construction in the second decade (2021-2030). However after the mode and then preferred routes were identified, AT and NZTA became strangely reticent about protecting them, despite the council providing a budget of $30m for this purpose. The situation became somewhat more complicated in November 2014, when AT management suddenly announced a preference for light rail (trams) rather than the previously agreed trains. While refusing to be drawn into the argument (I am a committed tram supporter for where they work best – as an analogue for buses in the city and along the waterfront), as the council-appointed chair of the SMART stakeholders steering group, my concern has been to get the transport routes protected. However AT and NZTA have refused to deliver on route protection and persisted with the ‘light rail is better argument’ based on a dubious ‘business case’. For instance the latest costs of adding another track to the 3.5 km Onehunga Branch Line is claimed to be $578m. That compares with the $9m KiwiRail spent on building the first track in 2010. The same level of confidence can be placed in AT’s journey time ‘data’ that claims a tram coming from the airport and travelling along Dominion Road, would get to the CBD within a minute of an electric train. This despite the train being capable of travelling at 110km an hour – and despite the tram sharing the road for much of the way, having to stop at 20 tram stops, negotiating numerous intersections and keeping to the 50kph speed limit. Based on this sort of suspect methodology AT managers claim that connecting to existing rail lines would cost over $1billion more than connecting to a light rail line on Dominion Road (that doesn’t actually exist). Of course AT never thought to ask the public or undertook an airport passenger survey. AT’s ‘business case’ also studiously avoids international best practice – which is odd given we are dealing with the transport needs of an international airport. So last week I took myself off to Melbourne which is one major Australian city which does not have airport rail but interestingly has the most extensive light rail system in the world. At meetings with Victorian State government officials I was advised that Melbourne is planning on heavy rail for Melbourne Airport – not light rail. This on the grounds that trains provide a faster, more predictable journey time and carry a lot more people than street-running trams. While such a major Auckland Plan commitment as rail to the airport can only be overturned by the elected council, the real danger is that by deliberately allowing development in the corridor Auckland Council and NZTA will render that commitment meaningless – and this is actually happening. While on any objective assessment, heavy rail makes more sense than trams (or buses) for rapid transit to the airport, the final mode choice should be up to the Aucklanders who will build it. But Auckland Transport and NZTA, backed by the government, is determined that Aucklanders will never get that choice. Auckland deserves better than this rubbish. I couldnt agree more. Heavy Rail makes sense. Build it and they come. Auckland has come along way since I first started using Trains in 1994 as a kid. Those days trains were a Monday to Friday 6am to 6pm 30min peak and hourly offpeak. And the rail system was scary, unreliable and just something you wouldnt want to travel on. Today after alot of fiting with previous Governments even pro-road councils ( and many non unified councils) we have a network we can start to be proud of. I agree yes Auckland will have a place for Light-Rail/Trams again, Central Auckland is well suited for it, and couldnt come soon enough as many bus route (even with new double deckers) are at capacity or bursting. You are correct. While Heavy rail may cost a bit more then Light Rail out to the airport, they havent taken into account a new donimion road line aswell. Meaning it will cost near the same. Even if they built heavy rail with nice stations etc but at a basic standard (no gold plating as they tend to do) it will more then truely pay its way. We already have 57 Electrics (with a few tweeks to the networks) can be put on the network instantly on opening day of the line. It doesnt need to take years. And can be budgeted for. Yez they can argue we need more then 57 Electrics and I agree we do, but it can be a start to get the nework running while new nrw trains are built. Totally agree, to mislead us all and discount Heavy Rail, is short sighted. It must go ahead. They are only going on the cheap, then blame some one else later on, when they realised they made a huge mistake. Auckland needs these short sighted penny pinchers gone by lunchtime, and we need people like yourself Mike, that seem to see the vision that others lack. While Im too young to have been around in the Robbie years, I am so ashamed, that no one listened to him… Now look at Auckland. Sadly its happening again. lets keep fighting for heavy rail. We need a heavy rail train. I go to the airport regularly for work matters. I currently have to factor in 2 hours to get through traffic and road works and expensive parking. Perhaps that’s why they don’t want this. Someone may end up poorer for it. I am still fighting for heavy rail. While I totally agree that heavy rail seems to be a smarter solution than a tram, I wonder if you know the number of passengers per hour predicted to be needing rail transport to and from the airport in any given applicable time period. The difference in capacity between light and heavy rail is huge! Sadly in this globally warming era, too many cities are deciding against any new rail projects. Thanks for your opinion, and I am also stunned by the shortsightedness of transport planning and execution in Auckland. What is your view on what their (AT, NZTA, National) reason is for the rail opposition? You must know many of the politicians and technocrats involved, what is their motivation? How do they think Auckland and New Zealand is better without a rail option? Why are they so against even leaving the option available, that they resort to fudging the numbers? What do they have to gain? Do they have interests in road building, car, petrol companies? Mike. We should make a start now on the cheapest and most simple heavy rail link from Puhinui Road to the airport. Just 6-7kms in a straight line over mostly greenfield land that would be easily accessible with minimal cost and disruption. It could be up and running in less than five years. To avoid congestion add not one but two lines form Otahuhu to Puhinui and we have four tracks for trans to run on. It could cost a few tens of millions at most. It could be totally paid for with Phil Goff’s very sensible hotel room tax, a tax that you see in most tourist cities worldwide, certainly nearly every US state has such a tax. Just spend a few nights in Hawaii some time and see how much they hit tourists for and they keep returning. Agree. Except Mr Goff’s targeted rate has been poorly thought through. More revenue from hotels and motels to go to Ateed?? Predator free by 2050. Cleaner waterways by 2040. Now airport rail by 2047. Mike Lee is right. NZTA and the government have scuttled the good idea of airport rail in favour of a bus system. They actually cite cost. Here is a solution. Heavy rail from Otahuhu travelling between Pacific Steel and the Otahuhu workshops, under Saville Drive then, probably, over Robertson Rd to link up with SH20 and SH20a at their junction. Raise SH20 southbound lanes like the northbound lanes for the rail to travel under, then the rail will line run up in the centre of SH20 to the airport. This will save NZTA spending $500 million dollars between Penrose and Onehunga, as well as the cost of a rail harbour crossing at Onehunga or the wait for NZTA to build a new system all the way from the city to Onehunga and on to the SH20/20A junction. From Otahuhu, trains could alternate with Manukau City trains via Glen Innes to the city. A nice way to arrive. Connections with other destinations could be made at Otahuhu and Panmure. In fact these could be the only two stops for these trains after the Mangere stops at Montgomerie Rd and Bader Drive. This is an extremely cheap, but quality alternative to all other suggestions and could and should be embarked upon now. I really think given the incestuous cosiness here in NZ that we need to bring in international experts to peer review the rigged ‘business case’ AT claims justify excluding a heavy rail connection to Auckland International Airport. Phil Goff and Jacinda Ardern are totally reliant on AT and their paid blogger cheer leaders. Given the recent Herald editorial suggest it might be timely to write another letter to the editor. Mike why not start an online partition for heavy rail (electric trains ) to the airport. Thanks Kevin, good idea. Suggest you contact Public Transport Users Assn or Campaign for Better Transport. According to one news last night 18 million people came through Auckland Airport last year. That’s a lotta buses on already congested roads. Head in the sand approach again. Thanks Terry. AT have a report ‘Future Central City Access Study (2012) which predicted bus gridlock e.g. 140 buses per hour on Symonds Street by 2021. Now AT is proposing running so-called ‘mass transit’ ‘advanced’ buses from Auckland Airport in 2024. This is just untenable.